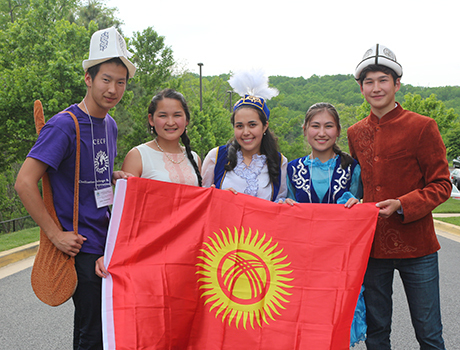 Eldos and his compatriots show off their Kyrgyz pride in Baltimore. All over the world, people of all generations talk every day about global and local problems. What kinds of things have people done to solve them? There are still wars because of territorial problems between countries, religious beliefs, and ideas of becoming more powerful. Where can we see humanity? I saw it in Baltimore. We had wonderful sessions by a priest, rabbi, and two imams, who showed us that the three religions call for peace, love, and mercy. Students confirmed this by their presentations, dances, songs, poems, and performances. It was extremely hard to part with my BUBW family. There is humanity in the world! A new generation has the power not just to talk about current issues but solve them and create a better world.